East Coast Trains Ltd, Keolis/Eurostar East Coast Limited and Inter City Railways Limited have all passed the Government's evaluation. 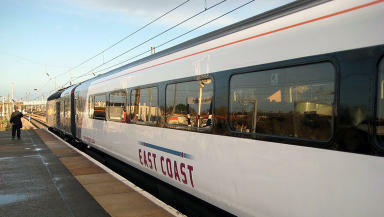 The shortlist of three bidders for the East Coast rail franchise has been announced. Companies that have passed an early evaluation stage will now be asked to develop their plans before the Government invites them to tender on the line. The three shortlisted bidders are East Coast Trains Ltd (FirstGroup plc); Keolis/Eurostar East Coast Limited (Keolis (UK) Limited and Eurostar International Limited); and Inter City Railways Limited (Stagecoach Transport Holdings Limited and Virgin Holdings Limited). First Group already operates First Great Western, Stagecoach own South West Trains, Virgin runs West Coast services from London, and Keolis has a stake in Govia, which operates Southern and South Eastern. The Government said they would like them to increase speed and comfort on the line, as well as show how they would use the multimillion pound government investment on the route. "That means new services and journeys that are faster, more punctual and more comfortable. When these companies are developing their proposals they should be looking at ways to innovate and grow the service. The East Coast line, which runs from Edinburgh to London, was taken into government ownership in 2009. The Government insisted the route needs a private sector investor to meet future rail demands. The new service is expected to start in February 2015. But transport union the RMT reacted with anger to the proposals. General Secretary Bob Crow said privatising the route would cost the British public hundreds of millions of pounds in lost income. He said: "The publicly owned East Coast is Britain's most successful rail operation carrying more passengers per mile, more efficiently and with the highest levels of passenger satisfaction and handing over £200m a year back to the taxpayers while comparable private train companies rob us blind. "That is what the government are out to destroy. The fight to stop this outrage goes on."